Orlando Limousine and Sedan ground transportation service, serving the Orlando and Central Florida areas, as well as Out of Town Charters throughout the State of Florida. 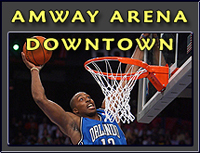 AllGems Orlando Limo Service offers professional Amway Center and Downtown Orlando transportation service to the various Orlando Sports and Entertainment events held in the Central Florida area. Many people choose to make attending an Orlando Magic game and event to remember, and arrive in style with one of our luxurious stretch limousine vehicles, our Limo Party Bus, or other luxury vehicles. Orlando hosts many concerts, events, conventions, or other sporting events. AllGems Orlando Limo Service is proud to serve the Orlando and Central Florida area, while meeting the many professional limousine and luxury transportation needs of our residents and guests to Orlando Florida. We offer professional, courteous, and dependable Orlando Amway Center and Downtown Orlando Limousine Transportation Services that will always exceed your expectations. Our Limo Orlando transportation vehicles are impeccably maintained, clean, and always in top operational readiness. Contact us today for your Limousine transportation needs at 407.438.3074 (locally) or outside the Orlando area at Toll Free 877.625.4367 for a free estimate and to reserve your Amway Center or Downtown Orlando limousine or sedan transportation. Contact AllGems Orlando Limo Service today to request a quote for your Orlando / Central Florida Limousine and Transportation needs by calling Toll Free: 877.625.4367.